Sealing is the last step in the anodizing process and can be done by several different processes, though the main reason for all the different sealing processes is to close the porous aluminum oxide layer after the anodizing step. Without a high quality sealing the anodic coating feels sticky and is highly absorbent to all kinds of dirt, grease, oil and stains. The sealing gives a maximum corrosion resistance but minimizes the wear resistance of the anodized oxide layer. 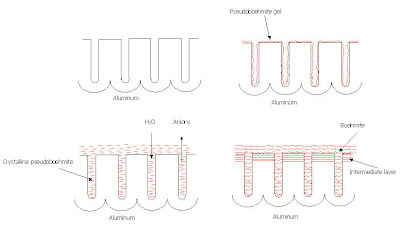 When Hot DI sealing, the anodized part is immersed into hot (96 – 100°C / 205 - 212°F)deionized water and a hydrated aluminum oxide, boehmite, will be formed in the pores, see the drawing below. The process begins by the precipitation of hydrated aluminum oxide as a gel of pseudoboehmite. This precipitation is controlled by diffusion, pH and chemical composition of the sealing solution. Increasing pH will start a condensation of the gel and now crystalline pseudoboehmite forms and the pores will be filled up. During the last period of sealing this pseudoboehmite will recrystallize to form boehmite starting at the surface. This hydrated aluminum oxide (boehmite) has a greater volume than the aluminum oxide. Many different sealing times have been suggested but the most common used in Europe is two - three minutes pr. µm of oxide layer. This process will happen partial by it self over time with the moisture in the air. This process is very dependent of the temperature and pH of the sealing solution. 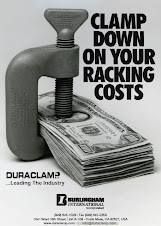 Sealing at 96°C (210°F) requires about 6% longer sealing time than 98°C (210°F). This dependency of the temperature makes mid-temperature sealing, which works at 60 - 80°C (160 - 180°F), a little more prone to leaching of colors. These solutions often contains metal salts and organic additives, but has a lower energy cost. The process is still using the fact that aluminum oxide is hydrated to boehmite. This process is very slow, so a warm water rinse after the sealing will accelerate the impregnation process.